It’s been nearly a year since the U.S. began escalating tariffs and other import restrictions on goods entering the country, creating uncertainty for business leaders with international supply chains. The authorization of tariffs on Chinese imports in March 2018 set off the first of many interventions by the U.S. government to address unfair trade practices and imbalances with foreign countries. These actions mark a departure from decades of free trade and a move to so-called “managed trade,” according to Dan Ujczo, cross-border practice group chair at law firm Dickinson Wright, who led a panel discussion at the inaugural Cross-Border Connections conference in Detroit on March 5. The event was organized by three ACG chapters from Detroit, Toronto and Western Michigan. Attitudes over trade have changed dramatically over the last 30 years, Ujczo explained. Since the end of the Cold War, goods and capital have passed more easily between countries as they reduced or eliminated tariffs and expanded free trade networks with agreements like NAFTA and the Treaty of Lisbon, the basis for the European Union. However, the election of Donald Trump reversed this trend, Ujczo said. President Trump, who campaigned on renegotiating the country’s trade partnerships to address imbalances, withdrew the United States from the Trans-Pacific Partnership, which would have bound the country and 11 other nations in a duty-free arrangement. At a time when the U.K. is preparing to withdraw from the EU and isolationist sentiment is on the rise, the global trade environment is changing quickly as business leaders struggle to adapt. Since the start of the Trump presidency, the U.S. has become involved in two major trade disputes: The much-publicized feud with China and the growing friction with its North American neighbors. Both instances involve duties targeting steel and aluminum. The first round of tariffs began in March 2018 when the Trump Administration authorized a 25 percent tariff on steel and a 10 percent tariff on aluminum. A few months later, the administration imposed the same penalties on steel and aluminum imports from Canada and Mexico. While the barriers have helped some industries by reducing foreign competition, the higher costs have been a burden for companies that rely on those inputs to make their products, such as Aetna Bearing Company, a Detroit-based manufacturer of ball bearings and other components. Ujczo said there’s evidence that the costs offset by the tariffs have penetrated most of the supply chain. He cited a paper published by the Centre for Economic Policy Research that showed tariffs are costing the U.S.—mostly businesses—$1.4 billion per month. “And the president still seems to believe that it’s the foreign countries that are paying those tariffs and filling our coffers when it’s all of us that are paying for it,” Ujczo said. 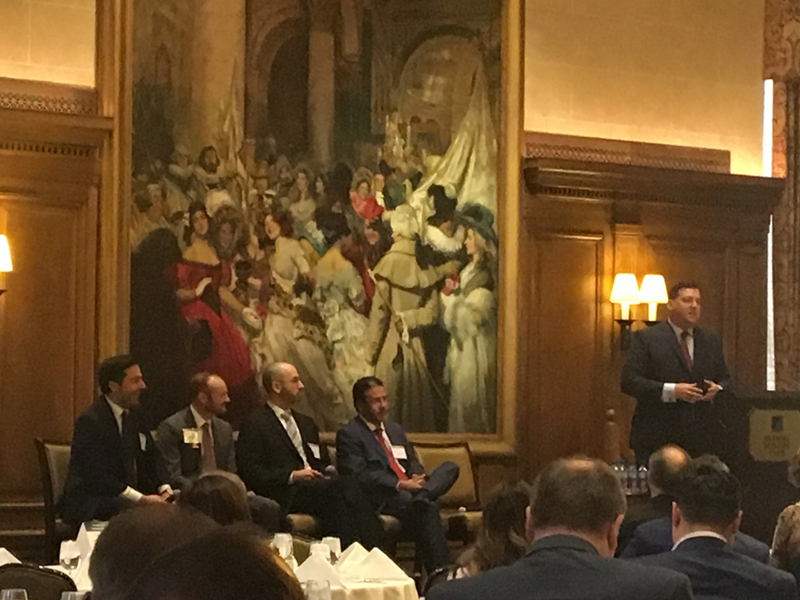 From left, Alex Kotsopoulos, RSM Canada; David Olsen, PNC Bank Canada; Kal Beidas, Aetna Bering Company; Sergio Lora Gomez, IQOM; Dan Ujczo, Dickinson Wright. Those cost increases also impact the lenders that companies rely on to finance business expenses, said David Olsen, regional president and principal officer of PNC Bank Canada. One company his firm worked with required nearly $8 million to finance the increased cost of steel. Preliminary findings from an American Chamber of Commerce survey indicate tariffs are tying up capital. “It’s a very real thing,” Olsen said. Tariffs may also have the potential to prolong an economic downturn, which many economists say is looming. Despite protests on the tariffs, Mexico and Canada agreed to requests by the U.S. to renegotiate NAFTA, which culminated in a new trade pact called the U.S.-Mexico-Canada Agreement. For Kotsopoulos, there is much to like about the deal. He praised its forward-looking stance on digital trade and provisions set up for international infrastructure projects. “In a nutshell, there’s a lot of good in the USMCA and a lot that needed to be changed, and a lot I think we should be encouraged about,” he said. While all parties have signed the USMCA, the treaty has not yet been ratified. Even if all countries ratify the new agreement, it doesn’t necessarily mean tariffs on Mexico and Canada will go away. Canada is pressuring Washington to lift the tariffs by ratifying the agreement in mid-March. Mexico is still considering the timing of its ratification. According to Sergio Lora Gomez, CEO of IQOM, a Mexico City-based trade consulting group, the country’s newly elected president is committed to the USMCA, but the government will likely take a “wait and see” approach to gauge the United States’ reaction to the new deal. “I think there’s a debate in Mexico, that we should ratify the USMCA before the U.S. does because that’s a very clear signal to the markets of where we’re headed,” he said. Congress will review a series of reports, including an economic impact study from the International Trade Commission due on April 19. If Congress doesn’t like the deal, it won’t ratify it; Trump has threatened to scrap NAFTA if USMCA isn’t approved. Despite the uncertainty they’ve caused, the tariffs have created some winners. “Let’s face it, it isn’t bad for Mexico because they’re competing with China,” Ujczo said. One check on managed trade may come through retaliation by other countries. Shortly after the U.S. imposed tariffs on Canada, Mexico and the European Union last year, those countries and trading organizations instituted their own penalties against the U.S. “As long as we have [Mexico and Canada] in retaliation, then I think we have a chance for these tariffs to be lifted,” Gomez said.